Designed for early priming of newly plastered walls. Recommended for use as a primer for new interior and exterior plastered walls. Also suitable for coating surfaces such as brick, concrete and other masonry surfaces. Protects the topcoat from alkali attack. Can be over coated with decorative water based and solvent based topcoats. 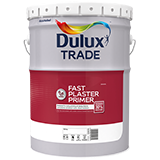 Tolerates moisture of up to 30%, allowing early priming of newly plastered walls.